My first #FMFparty post in my new space!! This makes me smile so, so big! Every week a group of us gather for conversation, encouragement and some good old belly laughs and then at 10PM our lovely hostess Lisa-Jo Baker posts a prompt. All chatter on the the Twitter comes to a grinding halt as us writers find our brave and peck out words. Unedited. Unscripted. Un-beautified. We write because we must and we write for the beauty of community. Won’t you join us? They’re the part of you where memories are made. Memories that seem to etch themselves in the depths of my being. And even though I’m forty-something and you’re sixty-beautiful I still find myself reaching for your hands and stroking the softness of the skin that stretches over long fingers – a testament to time and beauty. I don’t remember the very first moment I felt their softness against my skin. Maybe that’s the way it was meant to be, that a daughter would always know her mother’s touch. Like your skin was made for mine and mine was made for yours and how we just know to the very marrow of our being that we fit – perfectly. Lisa-Jo Baker just loves community! She loves to encourage women and mothers to realize that we are better together than we are alone. A mama to three littles who is the first to say “me too” when a day goes awry. When she’s not wrangling kids into minivans she’s the Social Media Manager for Dayspring and the Community Manger for (in)courage. 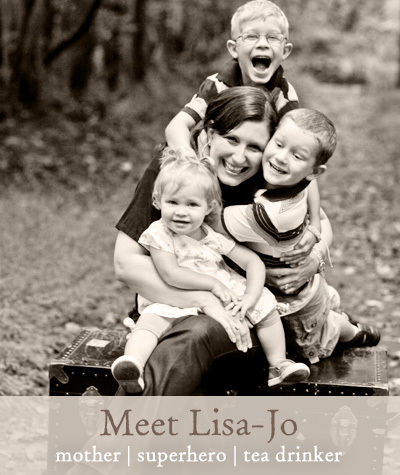 And just this past April she released her beautiful story about being Surprised by Motherhood. Beautiful post, friend! And you keep a secret well! I felt so good after reading this. I’m 28, and sometimes I feel silly at just how much I want my mommy. I guess that’s something you never really outgrow! My memory is a daddy’s hands one, though. When I was really little, I used to pretend to fall asleep on the couch sometimes, just so he would pick me up and carry me to bed. I felt so comfortable and safe! But in all seriousness–this post? Wow. Thank you. It makes me want to drive over to my mama’s house in the middle of the night to give her a big hug. There is so much that I love about this post. Perhaps everything. But the end? “Your touch brings me home” – that is golden. It is a breath and a kiss and a benediction. Love it. Second, this makes me want both of my parents. Thankfully, they live just around the corner. There is something special held in a hand, a touch a memory. Of home of love of being held. This is beautiful! Thank you for sharing. Phenomenal, stirring writing! What an honor to guest post and LJ is so right–you’re such an encourager! These words are beautiful, I just wish they didn’t sting my heart so hard. The touch of my own mother wasn’t the kindest in the grand scope of things. As a young child, I remember them being warm and comforting – it’s only as I’ve grown that began to question the hidden agenda within the warm comfort of her embrace and touch. Emotionally tormented, my mother’s touch sought to transform me into her image. My father? He enabled this. So now as I go a year and a half with no contact with them, I am learning to embrace Jesus’ touch in my life to be the true, real warm embrace that has always been there. I am learning to trust His guidance and judgement of whom He desires me to connect with so I can physically feel His truth. It’s not easy, but worthy. Onward I go, and I take your warm, embracing words of your relationship with your mama – and I am letting Him touch me warmly with them. It is uncomfortable because this is something I am not used to – consistently that is. Thank you for sharing. Healing is continuing for this heart that was broken by narcissism. I’m sad that you have painful memories. So many of us daughters do. I pray for your healing – for all of us daughters in need of that healing. This is Katie, Tonya’s momma….within these precious memories there is also pain,forgiveness,tears and healing. Except for the hand of God, I couldn’t imagine anything quite like a mother’s touch. Lovely. This was beautiful. I don’t have that kind of relationship with my own mom, but I try to cultivate it with my kids. I hope one day they can say the same things you just did! Yay!! For Canada! (and for coffee of course). Friend – we serve a God who redeems and through your mothering and your beautiful children you WILL know the power of these words in your own life! So much beauty here, my friend! Sounds like you have some sweet feelings of yourself and your mom. I know that the power of human touch is so vital to all children and to adults, too. As my 15-year old son has grown up, I’ve given and received many hugs and loving touches. We need touch don’t we… it evokes such powerful emotions! So glad you have such a beautiful relationship with your son which includes those beautiful moments of touch. This was beautiful. Love the power of words and how they can convey emotion and relationship and so grateful to read your words and discover your blog! Julie – I am so glad that you stopped on by. You are welcome here – there is always room for you! Beautiful words, and reminding me of all the memories of my parents loving me with gentle hands. Thank you. Kelly – so glad you stopped by and so glad this brought happy memories to you. I hope someday, my own girls feel just like this. What a beautiful post today. PattyAnn – They will… because you love them. They will. Blessings to you today. What a beautiful way to honor a mother. I don’t have those memories with my mother, but I am trying to make those memories for my children. Debra… so grateful we cling to the cross of a Saviour who redeems all things… and He is doing that as you mother your precious children. Thank you for sharing so honestly here. This was lovely! Thank you so much for sharing this! Amy – so glad you stopped by friend. Thank you! What a beautiful testimony to the power of a mother’s love. It is such a treasured relationship for most – including me. Thank you for sharing. My mother was always there for me. She would stroke my hair when I was upset, or sick, or just needed her. We are visiting her now and as I sat below her on the floor, she began to stroke my hair. It was comforting, and sweet, and wonderful. I’ll never outgrow my need for my mother. Kelli – my mom still does that to. If I’m on the floor sitting by her feet her hand invariably reaches out and strokes my hair… LOVE IT!!! I loved your take on the prompt, I was surprised by it! Tears sprung up, my Mom and I are in the same age range. We are physically very far apart now, and sometimes I long to hold her hand. My hands look like her hands did 20 years ago – including a ring she gave me early, one promised to me in a will, but that she wanted me to have when I was going through a difficult medical issue and she could not be with me.